We can suggest a number of ways to make your organization and activities better known. Enter them in our calendar today! Fill out our form to announce the activities you offer during the year, in any region of Québec. As a member of the Archéo-Québec network, you are invited to present your activities on this portal, free of charge! 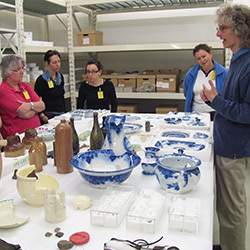 Provide all the details about your archaeology-related workshops, exhibitions, tours or lectures in the attached form. Simply click on thebutton below. Before filling the form, please prepare a title for your activity, a short descriptive text in both French and in English (no more than 50 words long in either language) and all the details related to timetables and fees, as well as the principal photo that will be used to present your activity. 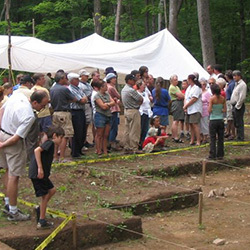 As a member of the Archéo-Québec network, you are invited to take part in Archaeology Month, an inclusive national event that is unique in Canada. Every year, this event mobilizes over 100 member organizations, partners and collaborators! To take part, you should submit your activities through this portal. Enter the details concerning workshops, exhibitions, tours, digs and talks that would be suitable for Archaeology Month in the attached form. Simply click on the button below. * Certain charges apply. Details are provided on the registration form.